Singer/songwriter Trevor Hall is known for his music that generates sold-out tours and collaborations with artists such as Steel Pulse, Ziggy Marley, Jimmy Cliff, Matisyahu, Michael Franti, Xavier Rudd and Nahko & Medicine for the People. 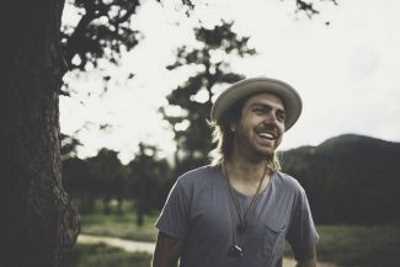 STEAMBOAT SPRINGS — Music for the mystical, folk-rock troubadour Trevor Hall is a source of healing. "But it's a much bigger healing when it's shared," said Hall, on a break from his national tour at home in Boulder earlier this week. Sharing music has become the lyricist and guitarist’s life mission, and it’s guided him to cultivate a massive following through more than 15 years of sold-out tours and collaborations with artists such as Steel Pulse, Ziggy Marley, Jimmy Cliff, Matisyahu, Michael Franti, Xavier Rudd and Nahko & Medicine for the People. After decades of seven studio albums, four on the previous Geffen & Vanguard record label, Hall’s newest album, "The Fruitful Darkness," will be his first independent release funded through a Kickstarter campaign. It has already garnered more than 200,000 Spotify streams since its release on Sept. 15. As part of his tour in support of the new endeavor, Hall will be performing two shows on Dec. 30 and Dec. 31 at Cervantes’ Masterpiece Ballroom in Denver. A bit unconventional, the album, Hall said, journeys through the unknown as opposed to playing it safe and will be released in three-song installments on four specific lunar dates. The first two parts of the album have already been released with the third out in January and the fourth in April. "When you release an album all at once, some songs get lost and stories go untold," he said. Earlier this week, Explore Steamboat caught up with Hall to find out where the inspiration for his newest album originates and the stories behind the lyrics. Explore Steamboat: What are some of those stories you want to share with listeners? Trevor Hall: The overall theme of "The Fruitful Darkness" is from the past couple years of my life, which have been really hard. But I got really into astrology, because I was going through a period of Saturn return, which everyone goes through in the form of a difficult time. But even with that said, you can reap your greatest lessons. So it inspired this journey of the "fruitful darkness," of going into the dark and going in to the places that we tend to shy away from and try to cover up, push away — to go there and face those, befriend and learn from those spaces that scare us, because some of our greatest lessons and those pearls of our life can be found in those spaces if we choose to turn in. A lot of the songs have to deal with that journey and the lessons I learned along the way. ES: It seems like a lot of your music is inspired by roots reggae acoustic music. Why do you think that's a good vessel to deliver the stories and/or teachings found in your music? TH: When I was growing up, that was the music that really just moved me. I think when we look at all different types of music, reggae roots is this universal rhythm. It's hard for people not to move their feet or to not look in. It's simplistic in nature, and I think that quality relates with our hearts no matter where you're coming from. That music has such a universal quality because of the way it feels — the rhythm and the vibe. I think that's what attracted me to it so much, to that sound and it's definitely influenced my music, for sure. ES: What is it that drives you to be a musician? TH: One of my teachers in India said, "The songs are the real house, that's where we really live." It reminds me of who I am. It reminds me of my real home, my real nature. Without it, everything stops. ES: What is it about your music that resonates most with your listeners? ES: There's something about your lyrics that have the ability to instantly resonate on a deeper level, like with the songs "Bowl of Light" and "Forgive" from the album "KALA." How do you decide something is worthy of becoming a song or incorporating a phrase or lesson into your lyrics? TH: Well, I don't really decide, it's more of a process of letting the music decide. Music for me is getting out of the way — it's more a process of listening than writing. When songs come through, I don't really necessarily know what those are about. I can't explain them, but I can feel them, and I think that feeling is a much deeper language, and it's that language that I try to connect with. It's a process of me getting out of my way and shutting off all of the voices in my head to let that music be heard. ES: So what is that process like? How do you overcome those moments of writer's block? TH: Oh man, I don't know. I just have to wait, and when the songs come through, I just have to drop all of those extra voices in my head and honor the voice and pay attention. I can be in a place like Shangri-La or the Motel 6; it doesn't matter, when it decides it wants to come through, it comes through. Sometimes, I just have to wait, and it comes in time. ES: What's next on the horizon for you? TH: We're playing two nights in Denver for New Year's, and those will be our last two shows this year. But we are working on some new music videos set to release in January and then a "Night in the Village" tour. It will be a solo acoustic tour where I will have a slideshow behind me showing pictures that share a story of the songs along with a question-and-answer session after. We also have some big plans for the summer, and maybe one day we can make it back to Steamboat Springs. We used to play at the Ghost Ranch years ago.